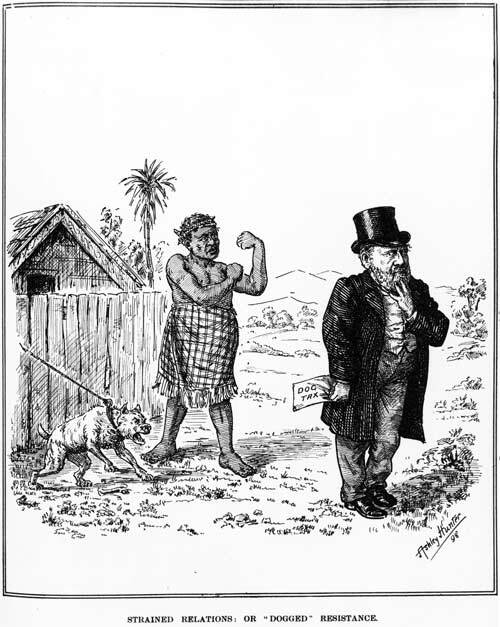 In this cartoon from May 1898 a Māori man lets Premier Richard Seddon know what he thinks about the dog tax. Councils were able to impose a tax on dogs, which was often resented by Māori. In 1898 a group in Hokianga, led by Ngāpuhi prophet Hōne Tōia, took up arms to oppose the tax. They were arrested and the incident became known as the 'dog tax war'.